We have modern GE and Aloka ultrasound machines. 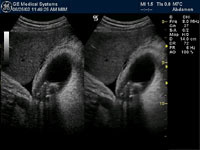 Ultrasound scans are usually done for the abdominal and pelvic organs. We also perform ultrasound scanning for musculoskeletal problems, testicular, vascular and breast imaging. Trans-vaginal scans are also performed for appropriate cases. All the scans are performed by Consultant Radiologists. You will have the opportunity to see the images and discuss any findings with the radiologist. We can also arrange for any further imaging as required. If the scan for is symptoms of gall-stones or a general abdominal scan, we advise a period of 4-6 hours of starvation prior to the scan. This is to enable the gall-bladder to distend well. Clear fluids such as water are permitted. 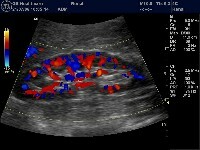 If a pelvic scan is requested, we require a full urinary bladder for optimum images. Want more information about having an ultrasound scan? Please refer to the detailed patient information leaflet on USS for information on what an USS scan involves. You could also visit the RCR virtual department website USS page and click on the relevant images for information.